Effective August 17, 2017, I will only offer 14k vintage flex nib upgrades on modern Pelikan pens, current or very recent models only. You can either mail me your complete Pelikan pen (and any spare 14k vintage flex nibs you might have) or you can purchase one of the already upgraded Pelikan pens listed and available for sale in this page. Please also remember that I do not manufacture those 14k vintage flex nibs used in these pen upgrades. No one does, as a matter of fact. My inventory of these nibs has become very small over the years and it is becoming harder and much more expensive to source those nibs. As such, please do not get very picky as to the attributes of the nib you are seeking or I will not be able to assist you. 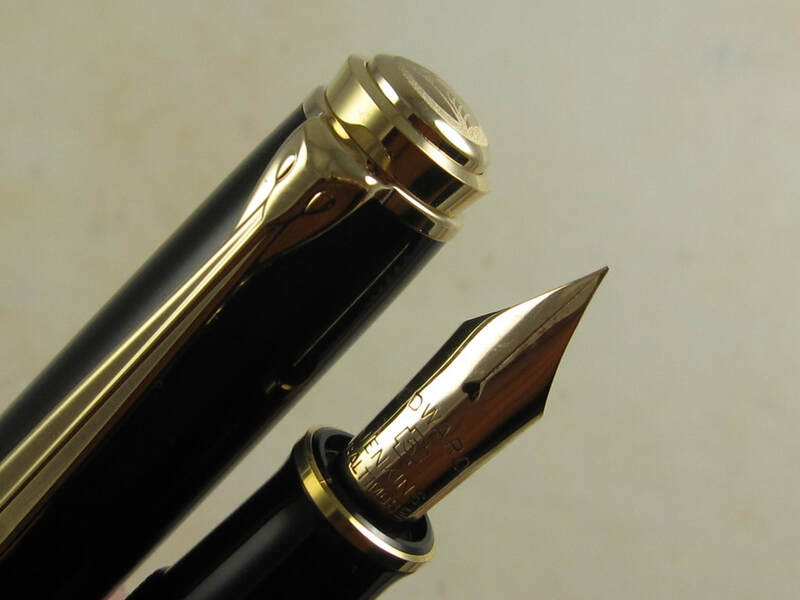 For those lovers of modern fountain pens who, like me, are tired of searching for TRUE, QUALITY, and DEPENDABLE flexible nibs in modern fountain pens, this new service offered by www.VintagePen.net intends to fill that big void in the fountain pen marketplace. 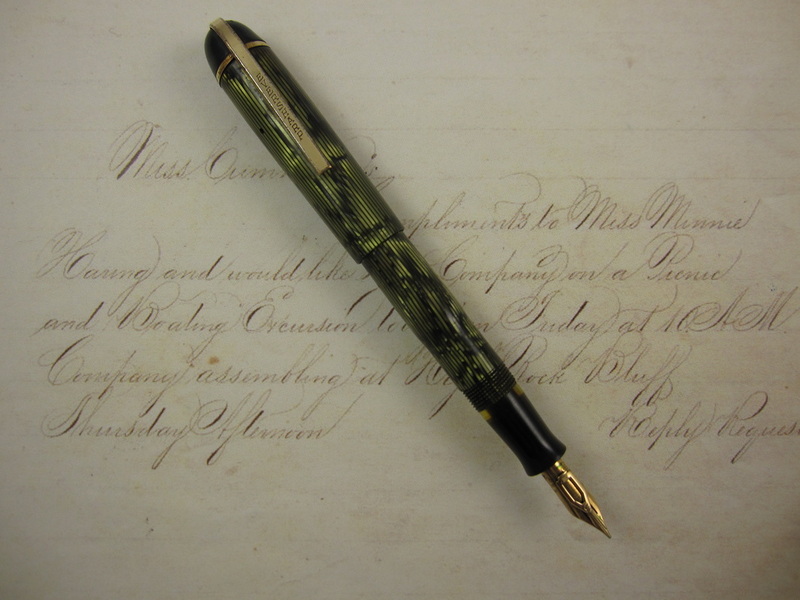 I will be offering a very limited selection of modern Pelikan fountain pens fitted with 14K vintage flexible nibs. 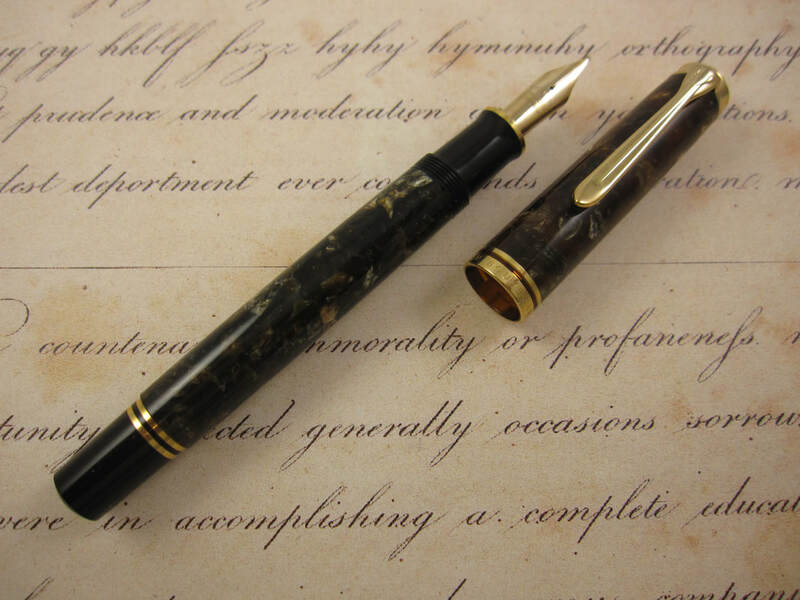 In general, vintage fountain pens came in standard, short sizes or with slim profiles. Unlike modern pens, very few vintage pens were offered as oversized pens, and most of the few offered oversized pens, such as the Parker Duofold Sr. and the Sheaffer Balance Oversize, came with firm nibs. Finding vintage oversized pens (for vintage standards) with flexible oversized nibs is not an easy task, and when you find them, get ready to pay dearly for those rare specimens. Modern pens offer very limited options of flexible nibs, and all of the so called "modern flexible nibs" I have tested offer a meager fraction of the flexibility and overall attributes found in vintage 14K flexible nibs. The modern versions I have written with have proven to be barely be flexible, to be unreliable writers with ink flow and skipping problems, even those which have been modified for enhance characteristics. ​ The difference between modern and vintage flexible nibs is simply paramount. I learned this the hard way, spending thousands of dollars buying and trying different modern pens with "flexible" nibs. It did not take more than one ink fill and many a time no longer than three minutes of writing to lose all desire to use them again. There is a tremendous difference between the modern and those vintage flexible nibs made between the 1880s and 1940s. I ended up selling, trading or giving away most of those pens as I knew I would not use them again. After having enjoyed (and become spoiled) to the wonderful flex attributes of a true vintage flexible nib, it was very hard for me to settle for little. These new Pelikan pen offerings upgraded with vintage 14k flexible nibs are simply the best compromise you will find between a modern fountain pen and a vintage 14K flexible nib. And the reason I use the word "compromise" is because these modern pens, even after being upgraded with 14K vintage flex nibs will not be as good as the real thing: A vintage pen with its correct vintage 14k flex nib, especially if this pen has been professionally restored, has all correct parts, and its nib has been professionally installed and tested by someone who truly understands about flex nibs and flexible writing. The modern Pelikan pen offerings upgraded with vintage flexible nibs offered in this page still require that I invest a huge deal of time finding the correct size nib that might work and fit into these Pelikan pen bodies. It is not uncommon to go over 200 vintage flexible nibs before I can find one that will fit well and that I deem as a potential candidate to reach ideal ink flow and performance flexible writing. I also take the chances of braking those flexible nibs and the pen bodies during this setup process. This task is not as easy as flipping a light switch, but highly specialized custom work, doing one pen/nib at a time and conducting extensive testing with every single pen. This custom work can easily amount to multiple hours invested into one single pen. As such, I will not accept requests such as "install a superflex XXXF-B into Pen XYZ and email me a picture of the writing sample so I can decide whether I want to buy it or not." Those requests will not be honored for the reasons outlined above. Please feel free to pick among one of the pens/nibs available for sale below. Other than that, I will only install a nib into a modern Pelikan fountain pen after you have committed to purchase it and paid for it in advance. About five years ago, I acquired a vintage Wahl Eversharp Skyline pen in Green Moire from the 1940s. This pen came in rough condition and with multiple cosmetic flaws. In my spare nib box, I had one of those very desired "adjustable #3" nibs that came in Wahl Eversharp Doric pens from the 1930s. Those adjustable nibs are absolutely wonderful flexible nibs. Their slider can be moved up and down the nib for different degrees of nib flexibility and line variation. I thought it would be a great idea to install that spare Doric adjustable #3 nib into my fixer-upper Skyline pen, but I also knew that was a very tall order. The feeds in Skyline pens and the Doric adjustable nibs are not compatible because the adjustable nib has moving parts, and unlike a typical flexible nib, the slider in adjustable nibs have flanges in the under side of the nib. These moving parts add another dimension to the challenge when compared with a one-piece flexible nib that has a perfectly smooth and even profile. Well, I was up to the challenge. After all, this was a fixer-upper Skyline pen which did not cost me much and I had a spare #3 adjustable nib (I did pay a fortune for this nib). Worst case scenario, I would damage the adjustable nib, one feed, one section, and waste a lot of my time ... after having done a lot of flexible nib setups in many different types of fountain pens, I was willing to take these chances to see the feasibility of this very unique nib upgrade. I started working on this nib upgrade project a little over a year go. I worked off and on as I wanted to take my time, learn as much as possible, and have fun tinkering with this monumental challenge. I only worked on it when I could give all of my attention to it, and I never rushed into finishing up. Significant progress was made. As I got closer to the desired goal, the pen case underwent cosmetic repairs, getting a replacement lever box and clip as well as light exterior polishing. The pen case looked more presentable after the cosmetic work. After additional adjustments and lots of extensive testing for a total of 14 months, the final goal was achieved. I a now the happy owner of a Wahl Eversharp Skyline "frankenpen" in Green Moire celluloid, upgraded with a Doric #3 adjustable nib, and not simply an adjustable nib, but a wet noodle F-BBB nib with the maximum responsiveness that can be found in a fountain pen nib. This nib is very smooth and capable of writing at any speed when not flexed. The pen works extremely well and has been a very reliable flexible writer. It does not leak ink (something I had big fears because of my attempts to use a feed and section that were not designed and intended for that adjustable nib with moving parts). 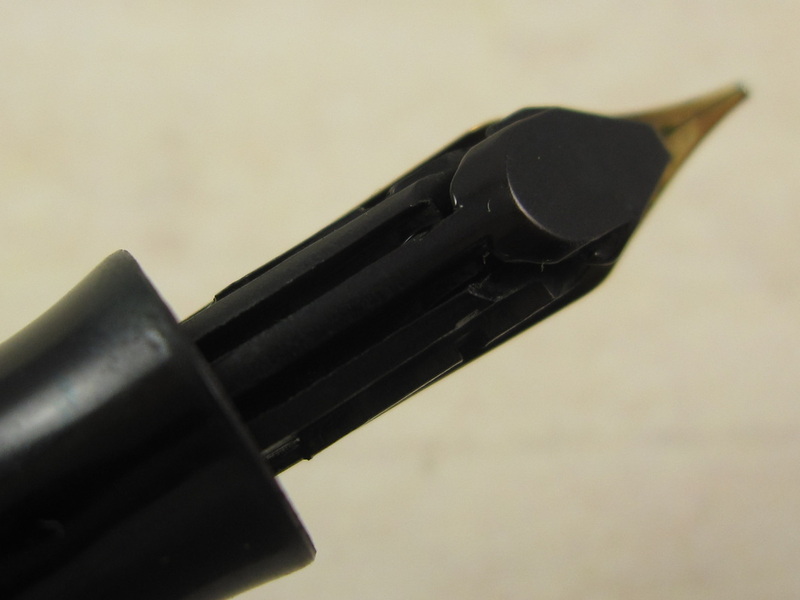 The pen does not blot either, it does not skip and is able to supply ink for every different type of writing demand: From very little ink demanded in hairlines at a very slow speed to the massive ink demanded when doing swells at slow, medium or fast writing speeds. It has flawless flexible writing performance and it is a very delightful flexible nibbed pen. Recently, I intentionally took this pen on a four flight journey accross country. The pen was filled with ink and I intentionally wrote with this pen as the plane was gaining altitude, while flying at maximum altitude, during descents, etc. And the pen never leaked, blotted skipped or missed one beat, regardless of its ink levels or how I wrote with it. That test in itself was the ultimate test I intended to do to ensure it was professionally setup for any task ... and the nib setup passed the test with honors. The time I invested in this project was well worth it. 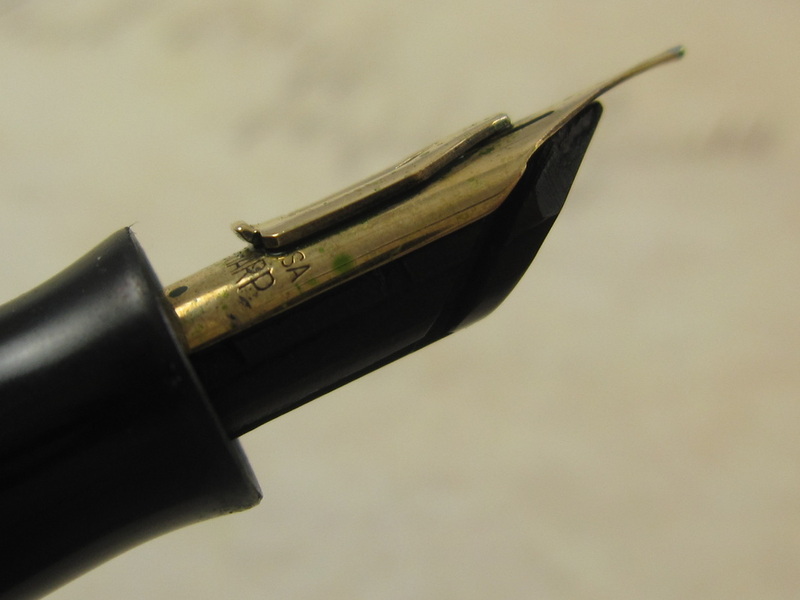 I learned a lot from it and it is now a very dear fountain pen in my personal collection, holding huge sentimental value for allowing me to learn a lot into the processing of flexible nib setup in fountain pens. ​Below are pictures displaying the nib fitted into the Skyline pen, feed, and some writing samples. The ink used is Diamine Light Green and paper is Rhodia Block 13 with 5x5cm squares. Enjoy the final product! Update: The Skyline pen body above underwent additional hardware upgrades since this article was originally written. A cleaner clip and a gold derby crown were installed. Light external polishing also took place. This pen is sold! 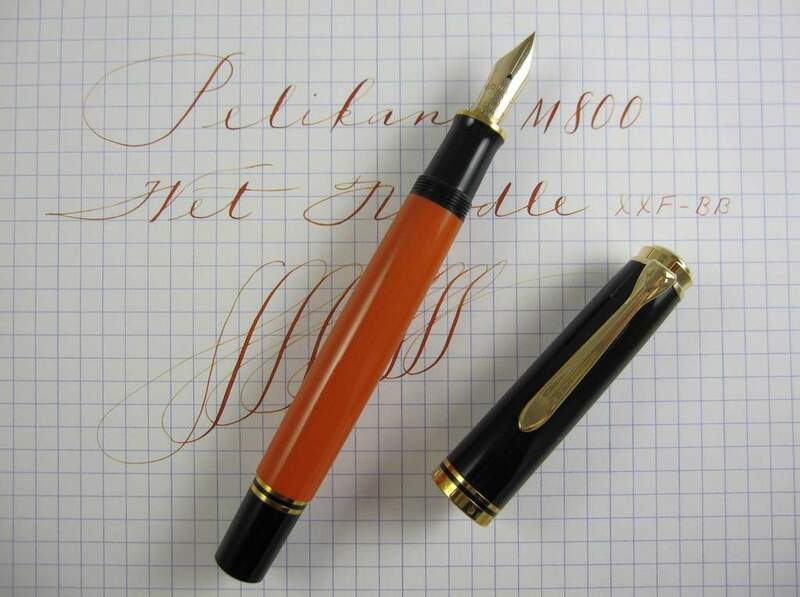 The Pelikan M800 pen/nib above is sold. It is depicted in this page for demonstration purposes so that visitors to this page can admire these rare beauties! 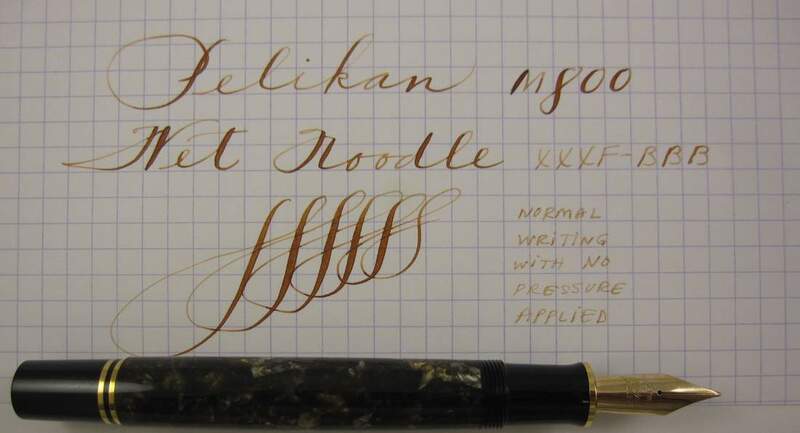 I have a very limited number of spare vintage 14K flexible nibs that might fit modern Pelikan pens, which do not allow me to frequently add pens for sale. If you are interested in one of the modern pen offerings in this page, act quickly as it may take a while until I can source additional nibs and add more pens for sale to this page. Please also take notice that I will not be able to make a writing sample for every individual pen available for sale or photograph every individual nib in this particular page of my website. I am leaving some pictures of pens that were offered at some point in time in the past with some writing samples. There are dozens of writing samples throughout this website and they will be a great reference as to what vintage 14K flexible nibs can accomplish. By doing this, I do not have to invest 2-3 additional hours per listed pen, and those savings are passed to you in the form of lower prices. Thanks for your understanding.